There is no real cure for the common cold, partly because there are many different types of rhinoviruses that cause the common cold. However, you can treat the cold naturally to minimize the symptoms. The goal of a natural treatment is to support the immune system so it can do its job. To support the immune system, you can use vitamins, minerals, herbs, and other nutrients that help boost it. Before using any herbal remedies, it is a good idea to check with your doctor. Herbal medicines can interact with certain medications and some should also be avoided before surgery. Check with your doctor to be sure that herbal remedies are safe for you to use for a cold. Garlic has antibacterial and antiviral properties and is believed to reduce the severity of colds by boosting your immune system. Try garlic when you cook. 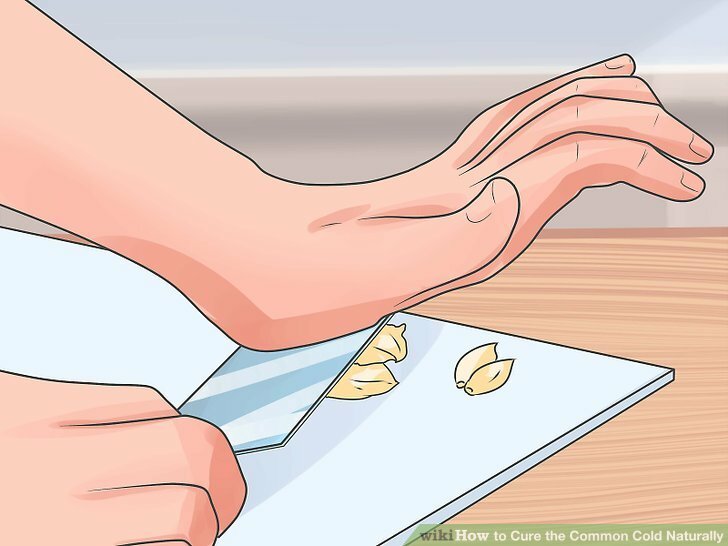 Add one to two cloves of garlic to your chicken soup. Make sure to clean and chop the garlic and let it sit for 10 to 15 minutes to release the allicins in garlic. Garlic is believed best used early and often to help treat a cold. Though you can take a supplement, fresh garlic is most effective. Echinacea is an herb that helps with early cold symptoms. It is also thought to reduce symptoms and shorten the duration of colds. 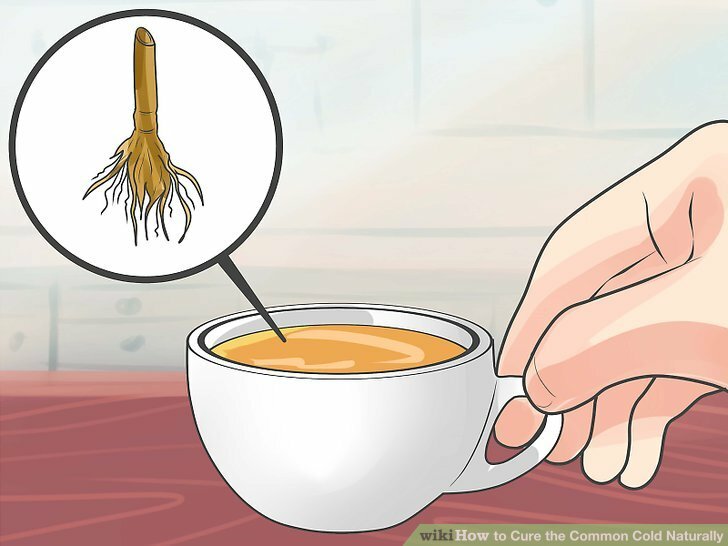 Put one to two grams of dried root or 15 to 23 drops of the pure extract in your tea, and take up to three times a day. 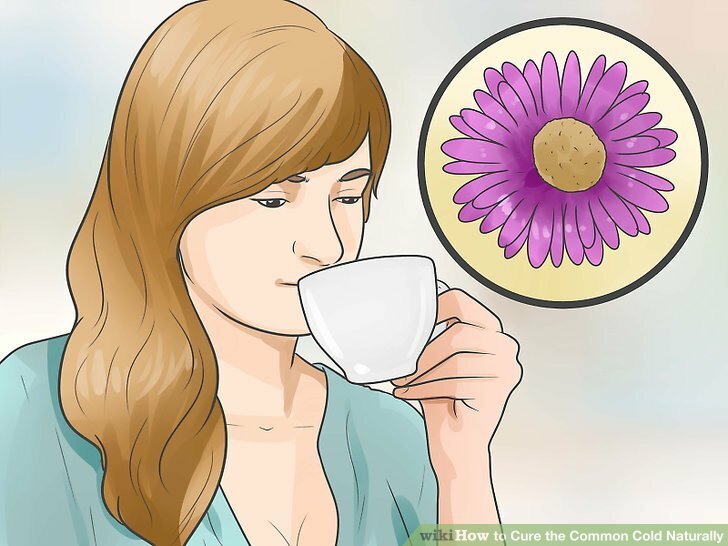 If you ingest echinacea, you need 300 mg, three times a day. It rarely causes any adverse effects, such as nausea and headaches, with rare allergic reactions. Elderberry is an herb that helps boost your immune system. It also has antiviral properties. 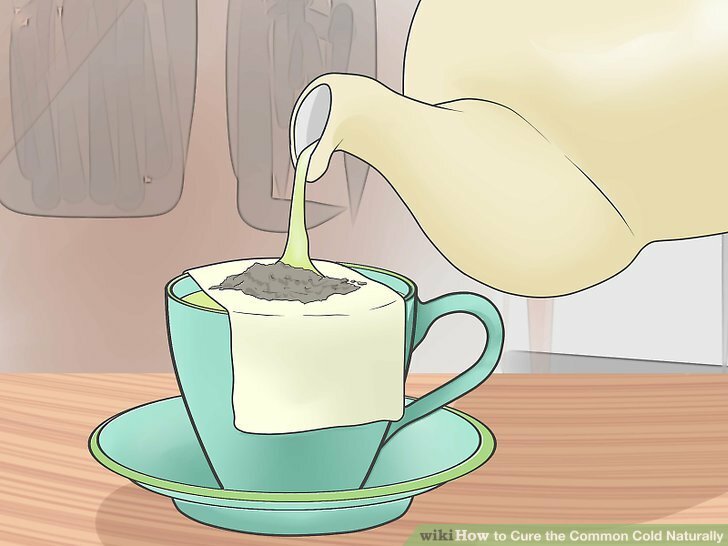 Steep three to five grams of the dried herb in one cup of boiling water for 10 to 15 minutes. Strain and drink three times a day. Elderberry has been clinically tested for influenza and has been shown to be effective. The products tested are commercially available and include Sambucol and Nature’s Way. Ginger is a root that has antiviral and antibacterial properties. It also can help reduce the production of mucus. You can add it to recipes, put it in tea, or take it as a supplement. However, make sure you get no more than four grams of ginger per day from all different sources. It is safe for pregnant women and children, though pregnant women should have no more than one gram per day. Doses for children vary, so ask your pediatrician. Sage is an herb that is used for sore throats. It makes a good in a tea and can also be used in recipes. Add 1 teaspoon of dried sage for every cup of water. You can sip the sage tea or use it as a gargle for sore throats. Eucalyptus is a great herbal remedy that is found in many different cold medicines, such as lozenges, cough syrups, and rubs. You can use the liquid extract, dried leaves, or fresh leaves. Eucalyptus oil can be used topically to help relieve congestion, loosen phlegm, and relieve sinus issues. 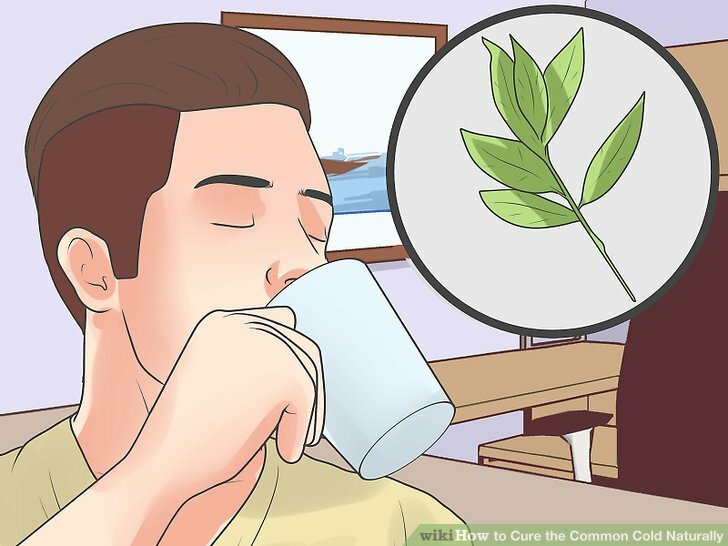 Dried leaves can also be used in teas. Do not ingest eucalyptus oil unless you are advised to by your doctor. Too much of this concentrated form of eucalyptus can cause toxicity. 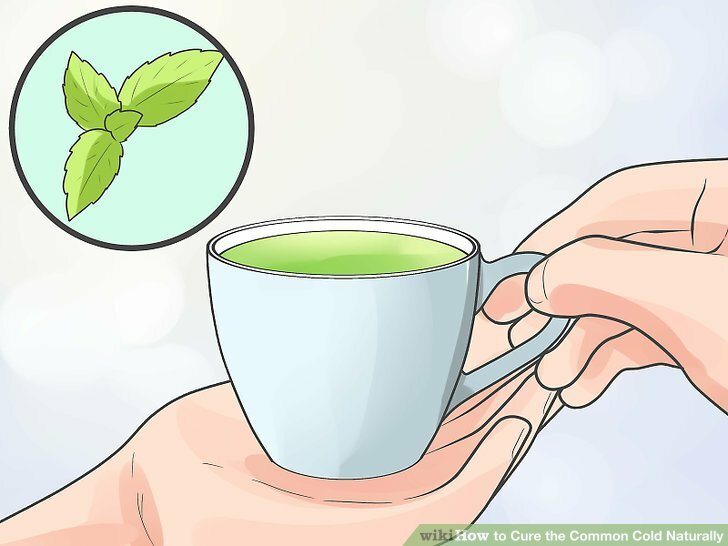 Peppermint and its main active ingredient, menthol, are great for treating colds. They help loosen phlegm and soothe throat irritation. They can be found in cold medicines and ointments as well as in teas. You can buy bagged peppermint tea or use a loose variety of the dried herb to make tea. You can also sniff peppermint essential oils or use them in steam treatments. Ginseng helps reduce the severity of cold symptoms and also helps prevent further sickness. You should take no more than 400 mg per day. Pregnant or breastfeeding women should not take ginseng. Ginseng has many drug interactions, so talk to your doctor before taking ginseng. Hot liquids can help loosen the mucus. Green tea contains antioxidants. You can also buy herbal teas that have specific formulas that are geared towards helping treat colds. Look at the list of ingredients for helpful herbs like the ones listed to find them in any tea blend you try. When you have a cold, make sure to stay hydrated. Try to drink nine to 13 eight ounce glasses of water each day. 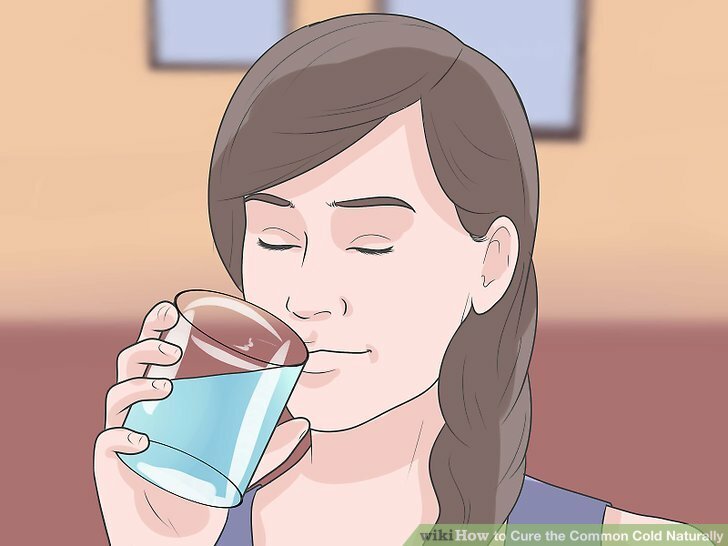 To help ease a sore throat, try drinking the water warm. The amount of water you need varies depending on your gender, age, height, weight, and other factors. However, the general guidelines will suit you well and keep you hydrated, especially while you are sick. Add honey to your water, which can help fight some infections. Also put lemon in the water for a source of Vitamin C.
Honey may help to reduce the likelihood of catching a cold. 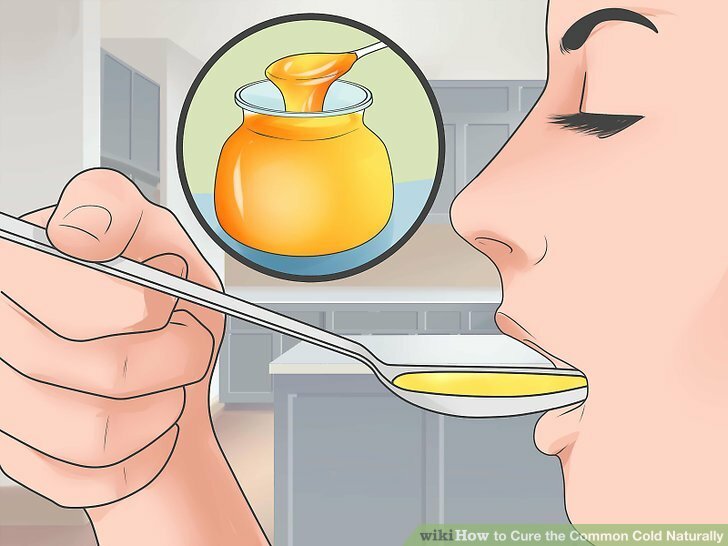 Consuming honey may also help you feel better when you have a cold. 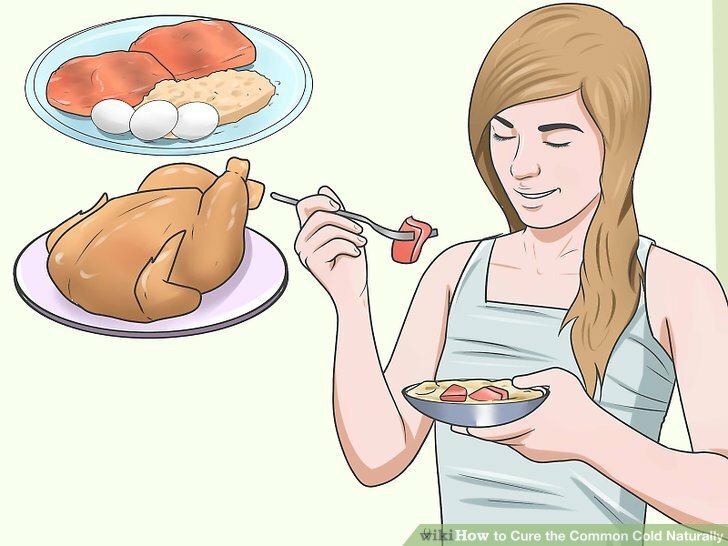 Eat a tablespoon a day when you are sick. You can also add it to tea, hot water, or on top of your food. Eat frequent small meals of solid, easily digestible food. This provides a constant supply of energy which aids your immune system. You want your food’s nutrition to help you immune system, not provide energy for activities. Make sure to limit the amount of activity you do. Even if your energy level rises due to the food, rest. To help boost your immunity, add quality proteins to your meals, like fish and skinless poultry. Chicken noodle soup is a great choice because it will give you some quality protein as well as other nutrients that may help boost the immune system and act as antiviral agents. Also add other nutrient-rich ingredients to the soup, such as brown rice and vegetables. It is believed that chicken soup helps reduce the production of mucus and boosts the immune system. Eggs are also a great source of protein. Try eating an omelet. The eggs not only provide protein, but also contain zinc, which can help boost the immune system. Eggs are also easily digestible. Try adding spinach or mushrooms, which contain important nutrients. Add a pinch of cayenne pepper to the omelet to help break up the mucus and increase drainage. Antioxidants are believed to help boost your immune system. Red peppers, oranges, berries, and leafy green vegetables provide rich sources of antioxidants. There has been some research that suggests that probiotics, also known as good bacteria, can help fight and prevent colds. Much like it helps infections in the intestines, it is believed that it helps with other infections as well. 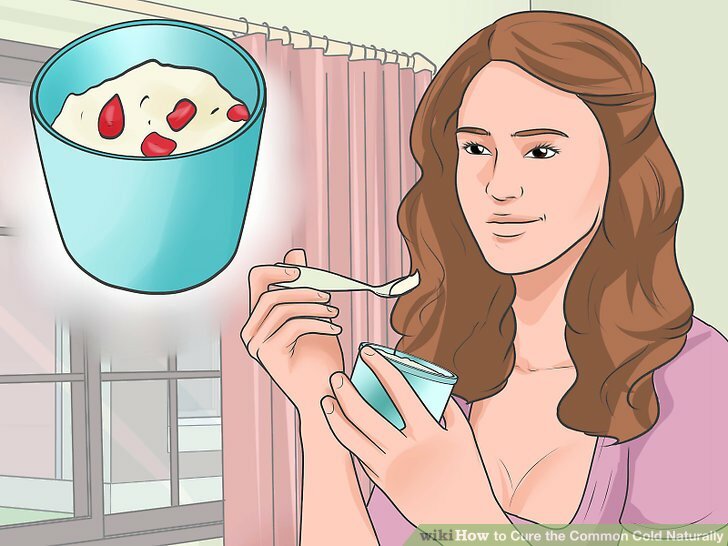 To get probiotics, eat yogurt with active Lactobacillus cultures. You can also take probiotics supplements. 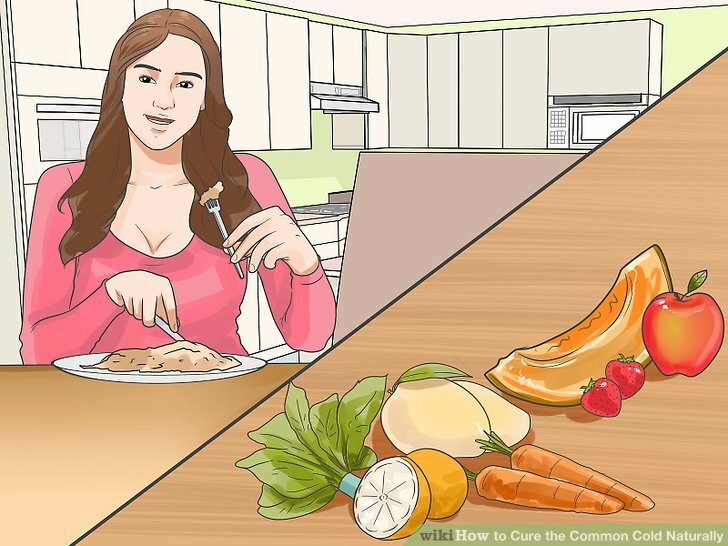 Vitamin A and beta-carotenes, which can be found in carrots, squash and sweet potatoes. B complex vitamins, such as riboflavin and Vitamin B6, which boost the immune system. Leafy green vegetables are good sources of B vitamins. Vitamin E, which is an antioxidant. Avocados are a good source of Vitamin E.
Vitamin C from food sources, such as citrus fruits and citrus juices as well as tropical fruit like papaya, pineapple. Zinc. Limit your zinc intake to 15 to 25mg per day. Don’t use zinc-containing nasal sprays because these have been associated with loss of the sense of smell. Selenium, which is an essential mineral. Limit your intake to 100 mg per day. Take a day off from work or school. Spend the day lying around the house doing nothing. Don’t clean, do work, exercise, or exert yourself. Resting helps you get better faster, and you won’t risk infecting anyone else. Find a small spray bottle. 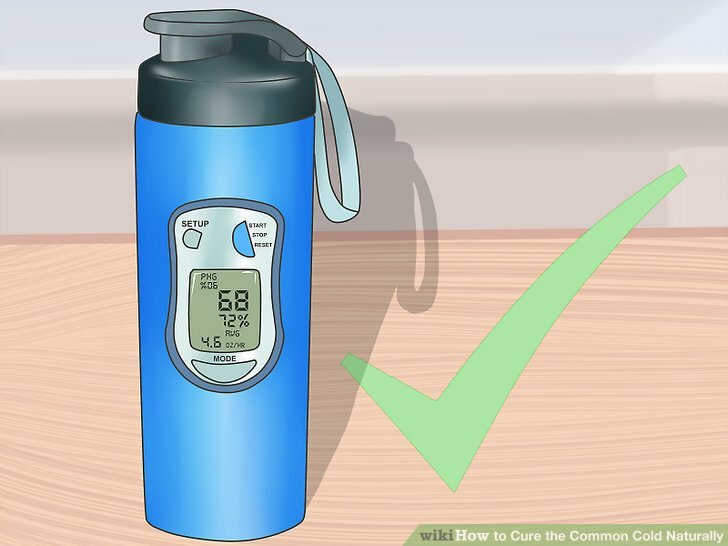 Find a spray bottle that measures around one to two ounces. If you will be using the spray to help an infant or a small child with nasal congestion, you should also have a soft, rubber-bulb syringe to remove nasal secretions gently and efficiently. A saline (salt water) nasal spray can be used as often as needed, and they can be used for adults, children, and infants. Saline spray can be made with sea salt or table salt. If you have an iodine allergy, or if you don’t know if you have an iodine allergy, use a non-iodized salt such as pickling salt or kosher salt. 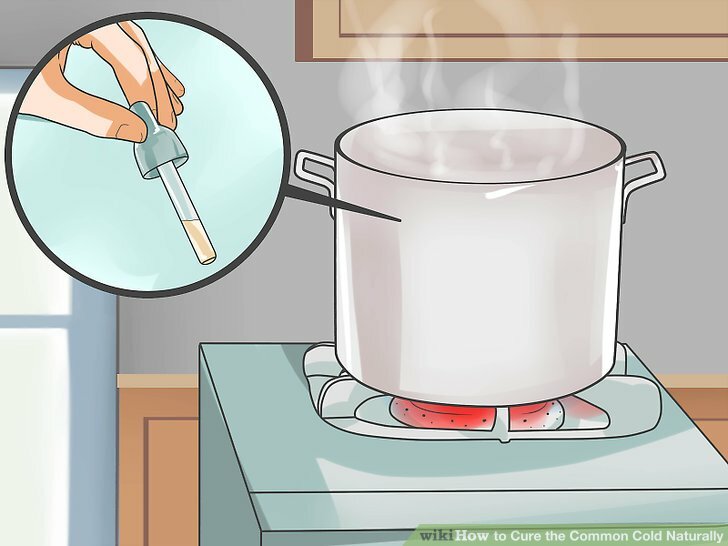 To start the solution, boil eight ounces of water. You can use tap or distilled water. After boiling, allow it to cool until it is only very warm. 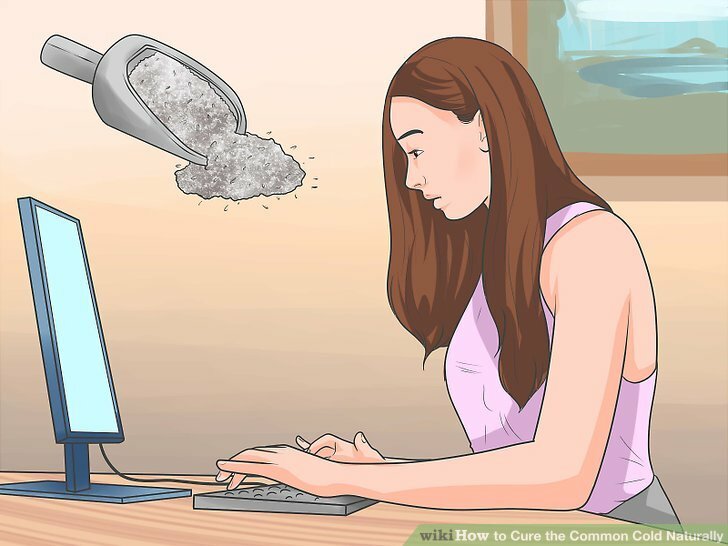 Add ¼ teaspoon of salt to the eight ounces of water. The ¼ teaspoon of salt will make a saline solution that matches the amount of salt in your body. You may want to try a salt spray that has a greater concentration of salt than your body. To do this, add ½ teaspoon of salt instead. This may be useful if you have major congestion, have a lot of mucus, and are having trouble breathing or clearing your nose. Don’t use a concentrated salt solution for infants or small children younger than five years old. Once you add the warm salt, mix it well. Make sure to mix until salt is dissolved. Next, pour the mixture into the spray bottle. If you find that it hurts your nose, add ½ teaspoon of baking soda. This will help make it less likely to sting a sore nose. 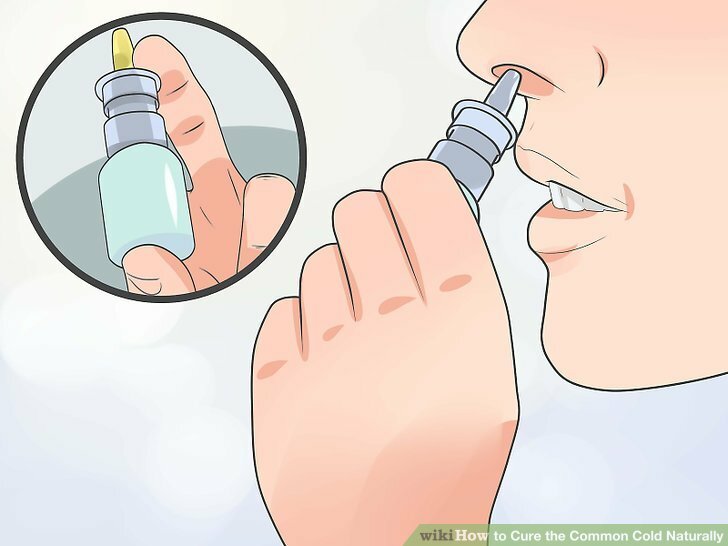 To use the spray, put the top of the squirt bottle into your nose. 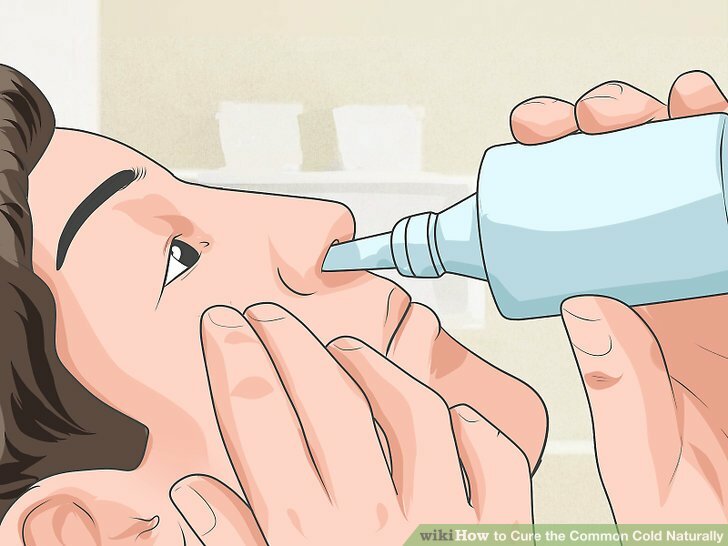 Then, spray one or two squirts of the saline solution into each nostril as needed. For infants and small children, spray one or two squirts and wait two to three minutes. Then, slightly tilt the baby’s head back and use a soft, rubber-bulb syringe to gently remove nasal secretions. Place the leftover saline solution in a covered container and refrigerate. Always warm up the refrigerated solution before using it. After two days, throw out any unused solution. This natural treatment is used to flush mucus from your system using the same saline solution in a process called nasal irrigation. Neti pots can be purchased at most drug stores or health food stores. 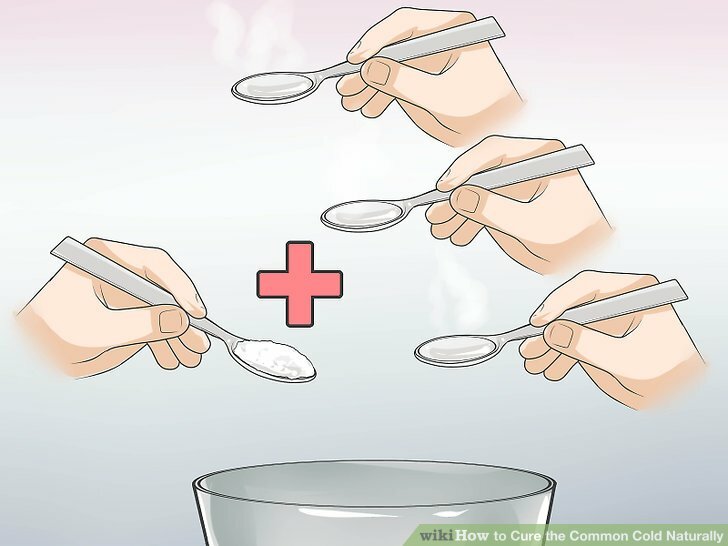 Make a solution of 1/2 teaspoon of kosher salt and one cup of water. Fill the neti pot with the solution. Stand over a sink, tip your head to one side, place the spot of the neti pot in one nostril. 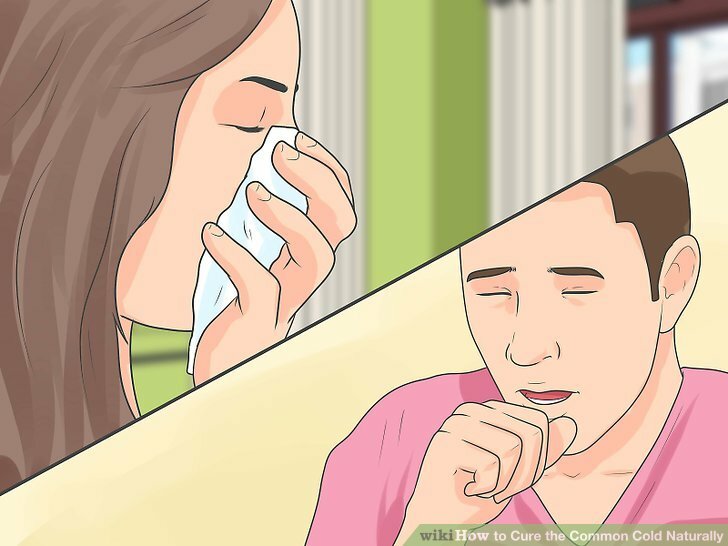 Pour the solution into your nostril and let it flow out the other nostril until the mucus in your nasal cavity is discharged. Fill the neti pot again and repeat with the other nostril. Take a shower using warm water followed by cold water. You can also just use cold water. 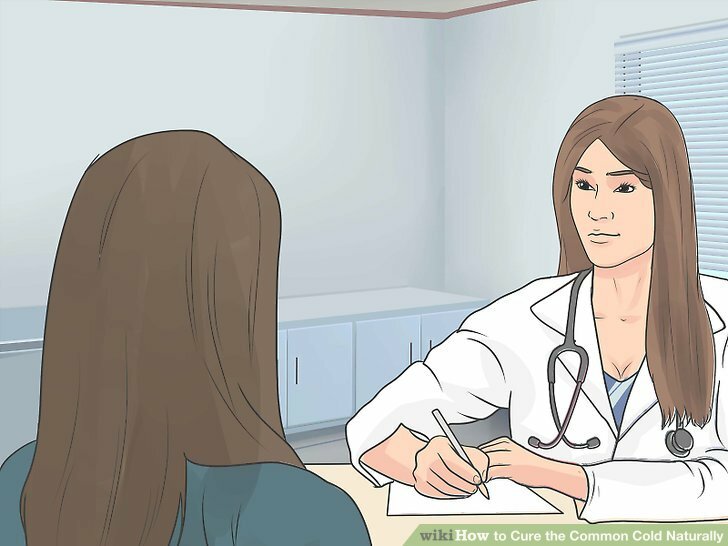 This may reduce the duration and frequency of common cold symptoms because cold water increase your white blood cell count, which will help you fight your cold. To do this, start with a very warm water. Next, turn the water as cold as you can and start spraying, using a removable shower head, from the feet up, then from the hands in. Be sure to also spray your back. Also spray the cold water towards your chest. 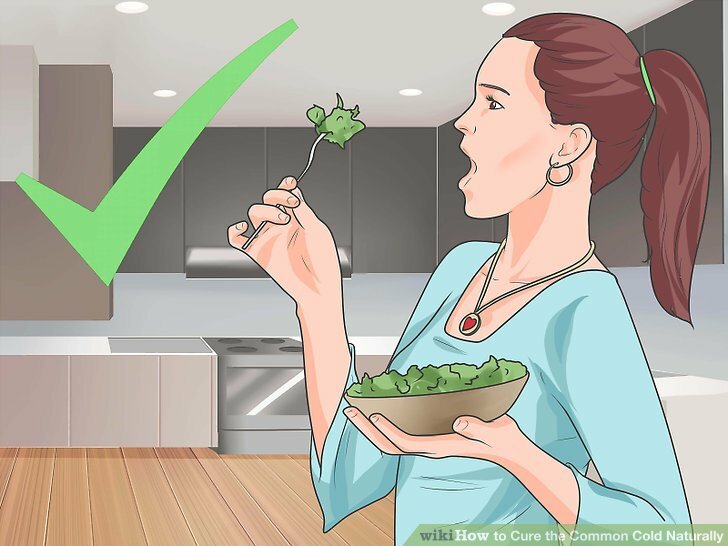 Do not use very cold water with the very young, the very old, or anyone with a debilitating disease, heart disease, implanted medical devices, or one who is pregnant, has lung disease, or is very weak. Use cool water only. Afterwards, wrap your body in as many towels as you need to totally cover yourself. Get in bed and stay under the covers until you are dry. This treatment is supposed to help reduce fevers and treat colds. You need a pair of 100% wool and 100% cotton socks. Soak your cotton socks in very cold water. After soaking, wring the socks out completely. Warm your feet in warm water. Then dry them completely. Your feet should be very warm and pinkish. Then, put on the cold, wet cotton socks. Put the wool socks on over the cotton socks. Once you have the socks on, go directly to bed. Wear both socks for the whole night. This approach usually starts relieving congestion within 30 to 60 minutes. 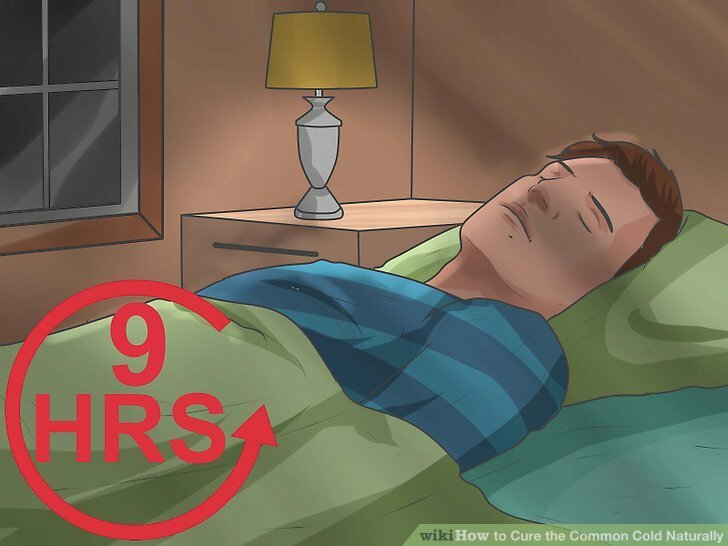 You can repeat this twice each night if symptoms are not improving. Steam can help open up the nasal passages, help thin out mucus, and help the mucus drain. Boil the water. Add one to two drops of essential oils containing echinacea, thyme, peppermint, oregano, ginger, or garlic. Start with one drop for each quart of water. If you don’t have the essential oils, substitute ½ teaspoon of dried herb per quart of water. 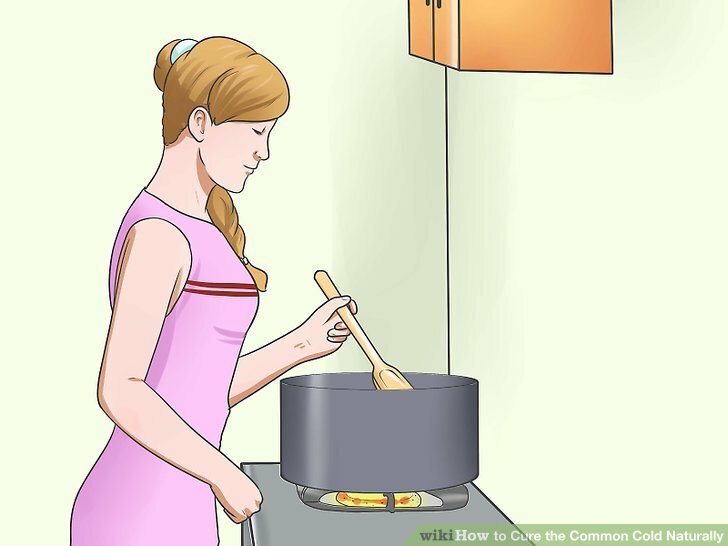 Once you add the oil or herbs, boil the water for another minute, then turn off the heat and move the pot from the heat. Echinacea is believed to have immune boosting, antioxidant, anti-inflammatory, and antiviral properties. Thyme and oregano boost the immune system and have antibacterial and antiviral properties. These also increase circulation of the blood by opening up blood vessels. Ginger has antiviral properties and increases blood circulation. Garlic has antiviral and immune boosting properties. 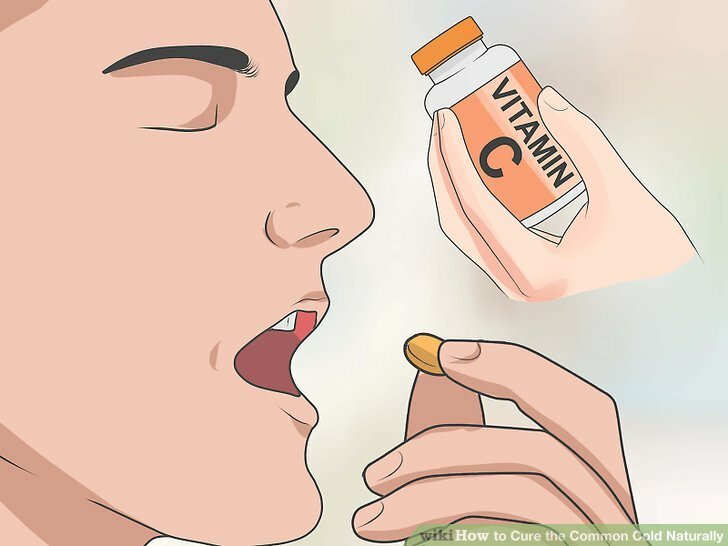 Treat the common cold medically. 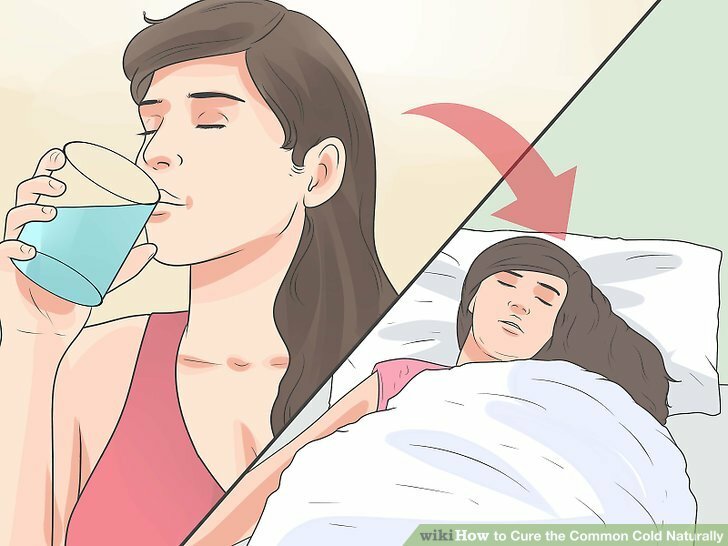 Common medical recommendations include getting plenty of rest, drinking a lot of fluids, and gargling with warm salty water. 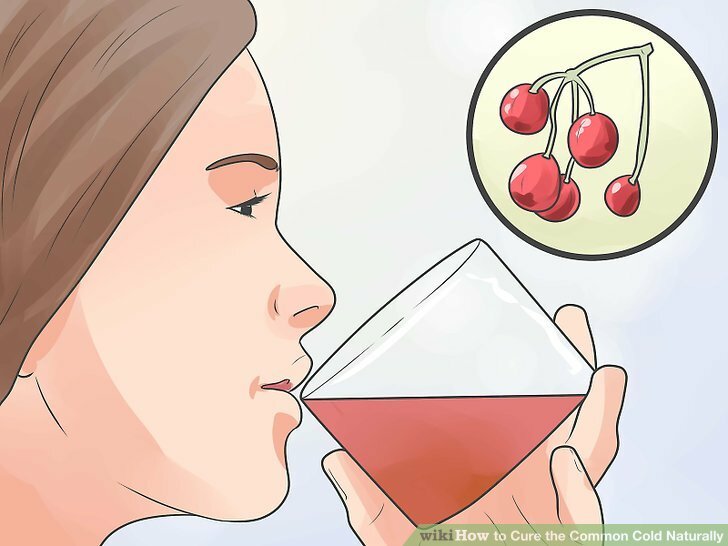 You can also use cough drops, throat sprays, or over-the-counter pain and cold medicines. 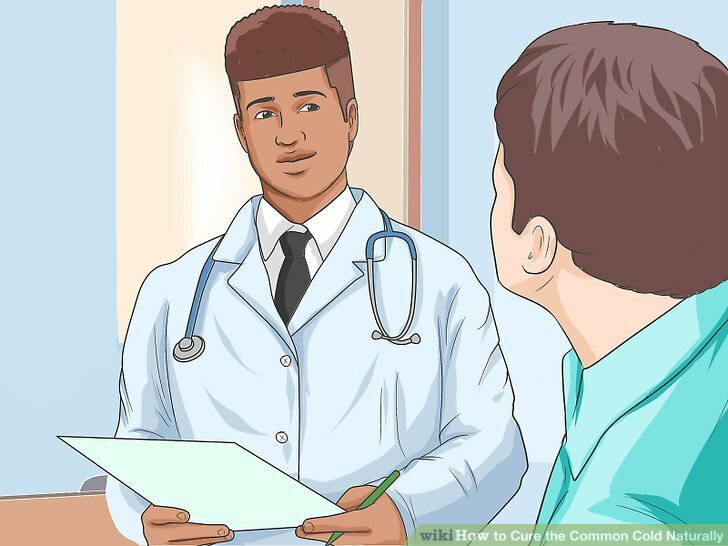 The patient is a child six months old or younger who has any fever at all. For all children, if the fever is 104o F or greater, call your physician.